Feedback Foundation facilitated a 2-day workshop on ODF (Open Defecation Free) Sustainability at Zilla Panchayath Meeting Hall, Yadgir, Karnataka on 10 th and 11 th January, 2019 with support from Tata Trusts. The rural part of the district declared itself ODF in October 2 nd , 2018. 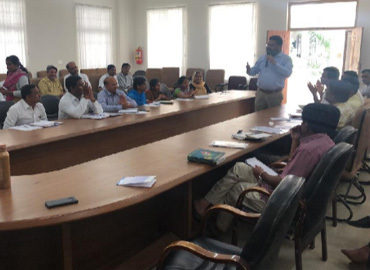 The district administration is now keen to assess its ODF status and develop a strategy for its sustainability so that there is no slippage in ODF behavior. This workshop provided a platform for all stakeholders to brainstorm and analyse, plan and strategize a road map to achieve the goal of ODF sustainability. There were 28 participants in the workshop, from all the 3 Blocks of the District including Programme Coordinators-WASH, SBM Consultants, Panchayat Development Officers, Assistant Panchayat Officers and MHM Fellows-WASH.